Founded over 4 years ago now by skincare expert Maria Winslow, Winslow Skincare has now grown to a team of 3 therapists working at the tranquil gardens at Borde Hill, Mill House Studio. At Winslow Skincare we specialise in results-driven skin treatments. 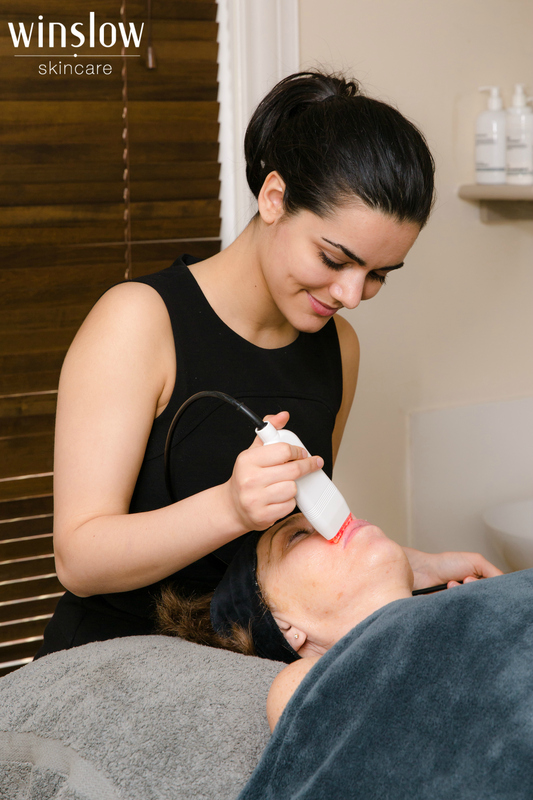 We are the leading, expert provider of results-driven, non-invasive skin treatments in West Sussex, helping clients of all ages to achieve healthy skin with a visible difference. We focus on your skin from the inside out and all our therapists are trained to the highest possible level and are constantly improving their knowledge and expertise with the latest techniques and products. Call 01444 849111 today to book your appointment with Maria, Rhi or Elle and start your journey to a healthy and happy skin! We look forward to meeting you. I love my monthly facial with Maria. Relaxing and stress free pampering definitely makes the best of my skin. Treatments are designed specifically for my skin. Highly recommended! I highly recommend this blissfull experience. A wonderful relaxing facial using heavenly scents. Thank you Elle i am looking forward to my next visit. I have found my holy grail of skincare now thanks to the excellent skills and knowledge of Maria and Elle.Fantastic facial ...will not go anywhere else now. Charming welcome. Delightful place. Gorgeous products beautifully explained. A lovely experience & my shin felt radiant after. It was more than a facial. It was an experience. Left feeling completely relaxed and my skin felt great. Some good advice was given with regards to my skincare as well. This was my very first experience of acupuncture and it was a wonderful experience from start to finish. I arrived in agony - I suffer from over active acid production in my stomach and when this flares up it's very uncomfortable and normally takes a few days of very careful eating to get back to normal. By time I left I felt great and was able to go home and enjoy my daughters birthday. Really impressed with the caci facial and Maria was so welcoming and knowledgeable. Would highly recommend this salon, so happy I tried it. Very friendly and welcoming staff, my daughter had a facial enjoyed it very much nicely run though steps of facial and lots of great tips. Could see visible results after 1 facial, Thankyou Winslow Skincare. I had an appointment with Elle for a facial and it was lovely. The Facial itself was amazing and my skin looks better than ever and I will using the tips that I was given. Elle was really friendly and I had a great time talking with her. I will definitely be going back to Winslow skincare. Visited for the first time Winslow Skincare for a Pro 60 face treatment with Maria and I loved it.My skin alteady looks better and i have an action plan on how to get my skin looking even better. I love coming here for my facial. It is so relaxing and welcoming. The owners are extremely knowledgeable. I have had many facials but I won't go anywhere else now! Elle was fabulous her knowledge was wonderful ,she made the experience very relaxing and my skin felt great immediately after . Maria is so knowledgeable. She inspires confidence. I love going to Winslow, it's such a treat. Maria is so knowledgeable, kind and gentle. You come out glowing and having learnt something, I will definitely be going again! I have had various treatments at Winslow Skincare over the last 3 years , including caci, micro dermabrasion and recently the cryo pen to remove age spots from my hands, the results are fantastic . This was my first treatment and what an amazing experience it was! Most polite lady with great knowledge about skin types and how they can help you, I learnt a lot for the time I was there and understand more about my skin than I ever have before! The treatment was very relaxing , considering within my job there is a lot of pressure often it was lovely to relax in the company of Maria. So I would recommend this to anyone! Wouldn't go anywhere else after having this done with the great experience I had! Thankyou once again! I had a great massage with Rhi yesterday and booked straight back in for another one- I would thoroughly recommend it. Very professional and friendly and tailored the treatment to match exactly what I needed at that time. I've previously had very successful skin treatments at Winslow Skincare and when I found out that Rhi had joined the team and offered massages I jumped at the chance of having one - something I've long-needed since having my twin girls a few months ago. Rhi was just brilliant. It was obvious the massage wasn't just 'text book' - she could tell the specific areas that were tense and worked hard to make them better. The room was really relaxing and very nicely decorated. A genuine mini spa feel. A week on and I still feel great - and I've booked in another session!